A longstanding division exists between hippocampus-dependent and non-hippocampus dependent memory since only the latter can be acquired and retrieved in the absence of normal hippocampal functions. In agreement with the familiar concept of “sleeping on a problem,” hippocampal-dependent memory consolidation is strongly supported by sleep. In a new study conducted by Anuck Sawangjit and colleagues, formation of long-term representation in a rat model of non-hippocampal memory was shown to depend on sleep and on the activation of hippocampus-dependent mechanisms during sleep. The researchers used rats encoded with non-hippocampus-dependent (novel-object recognition, NOR) and hippocampus-dependent (object-place recognition, OPR) memories prior to a two-hour period of sleep and wakefulness. Memory was either tested immediately or remotely after one or three weeks. 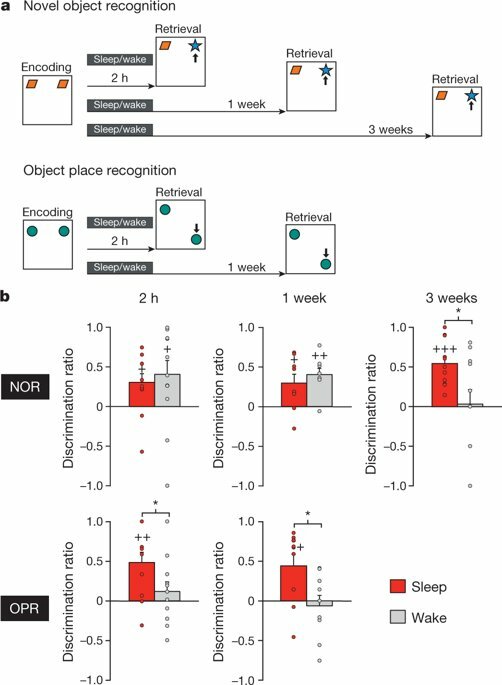 While object-place recognition memory was stronger for rats that had slept after encoding at both timepoints of testing, novel object-recognition memory only profited from sleep three weeks after encoding. At this timepoint (3 weeks), object-recognition memory was preserved in rats that slept after encoding and not in those that had been awake. 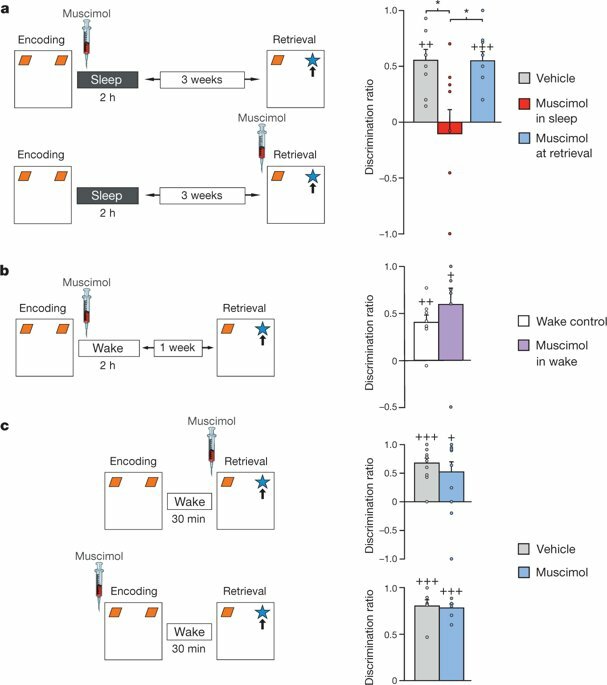 Of note, intrahippocampal injection of muscimol (a psychoactive constituent) inactivated the hippocampus during post-encoding sleep, and abolished sleep-induced enhancement of remote novel-object recognition memory. In contrast, injection of muscimol before remote retrieval or memory encoding did not affect test performance, indicating that encoding and retrieval of novel-object recognition memory were hippocampus-independent. Consistent with the view that neuronal memory replay during slow-wave sleep contributed to long-term memory formation, remote novel-object memory recognition was associated with spindle activity during post-encoding slow-wave sleep in the study. The distinction between hippocampus-dependent and non-hippocampus dependent forms of memory was highlighted in medical research when a patient underwent bilateral removal of large portions of the hippocampus and suffered severe anterograde amnesia. While encoding and retrieval of hippocampus-dependent memories required the hippocampus, this was not always the case for non-hippocampus dependent memory. Non-hippocampus dependent memory consisted of heterogenous memories, including motor skills and fear conditioning. Recent advances in memory research alongside the standard consolidation theory assume that episodes of memory were initially encoded into the hippocampal networks but redistributed across days, weeks and months to the neocortex for long-term storage during consolidated representation to thereby become independent of the hippocampus. For hippocampus-dependent memory, an active systems consolidation process was proposed based on the findings that neural representation of freshly encoded memories replayed during subsequent slow-wave sleep (SWS). By mechanism, neural replay originating from hippocampus networks together with sharp-wave ripples and thalamic spindles promoted the transmission of memory information. Repetitive occurrence enabled their gradual redistribution in extrahippocampal networks. The role of sleep during non-hippocampus-dependent memory is less well understood. In the study, Sawangjit et al, compared the effects of post-encoding wakefulness on consolidation of non-hippocampus-dependent and hippocampus-dependent forms of memory in rats to understand the evolution of consolidation effects with time. To accomplish this, the researchers used the novel-object recognition (NOR) task and object-place recognition (OPR) task as tests to determine non-hippocampus-dependent and hippocampus-dependent-memory. Performance on the NOR task typically relied on the perirhinal cortex, normal hippocampal functions were not necessary to encode or retrieve NOR memory in rats according to preceding studies. During a two-hour interval, the rats either slept or remained awake after task encoding. Retrieval was tested immediately after the two-hour interval or conducted after one week (NOR only), or three weeks later (remote tests) to test long-term memory. The NOR memory did not differ between sleep and awake states, but in contrast OPR memory significantly enhanced after sleep only and not while awake. Repeated reactivation of newly encoded hippocampal representation during subsequent slow-wave-sleep (SWV) had an impact on the consolidating effect of sleep on hippocampus-dependent spatial memory. Previous evidence also suggested that hippocampus-dependent and non-hippocampus-dependent memory systems interacted during consolidation. The researchers therefore investigated if hippocampal activity critically contributed to the integration of non-hippocampus-dependent memory by reversibly inactivating the function of the hippocampus. For this, the rats were infused with muscimol (a psychoactive constituent) into the dorsal hippocampus during sleep after encoding the NOR task. The effects of reversibly inactivating the hippocampus on NOR memory. Left, procedures; right, mean + s.e.m. discrimination ratios, with overlaid dot plots. a) To suppress hippocampal activity, muscimol was bilaterally infused (for 2 min) into the dorsal hippocampus, either during the post-encoding interval upon the first occurrence of continuous SWS (top), or 15 min before remote retrieval testing 3 weeks after encoding (bottom). Hippocampal inactivation during post-encoding sleep (red bar) abolished remote NOR memory whereas inactivation before retrieval testing (blue bar) was ineffective. Grey bar, vehicle injection. b) Muscimol (purple bar) was infused shortly after encoding while the rats remained awake during the 2-h post-encoding interval. Retrieval was tested 1 week later. Compared with untreated wake control rats (empty bar), which had intact hippocampal function and stayed awake during the post-encoding interval, hippocampal inactivation did not disturb but enhanced NOR performance. Timing (with reference to encoding), dosage and procedures of muscimol infusion were the same as in (a). c) Muscimol (or vehicle) was infused 15 min before retrieval testing of recent NOR memory (top) or 15 min before the encoding phase (bottom). Retrieval was tested 30 min after encoding (rats stayed awake during this interval). Hippocampal inactivation does not affect retrieval of recent NOR memory either during retrieval or during encoding. Credit: Nature, doi:10.1038/s41586-018-0716-8. Three weeks after, during remote retrieval testing, rats who had received muscimol injection into the hippocampus during sleep after learning did not show significant NOR memory. Comparatively, remote NOR memory was preserved in animals injected with the vehicle at the same timepoint. The result demonstrated that the hippocampus was crucial to form persistent NOR memory during sleep. Previous discrepancies of the hypothesis were thus resolved by the new results observed in the study, to show that the formation of long-term NOR memory relied on a hippocampal mechanism that was specifically active during sleep. Combined results confirmed that persistent long-term NOR memory formation relied on a hippocampal mechanism that was specifically active during sleep. In the architecture of post-encoding sleep, results were comparable to previous studies, and analyses revealed that remote NOR memory retrieval strongly correlated with measures of spindle activity during slow-wave-sleep (SWS). The combined results agreed with the idea that muscimol prevented long-term memory formation by suppressing hippocampal ripples as well as its associated reactivation during SWS. The findings by Sawangjit et al. did not completely rule out contributions of REM-sleep-related mechanisms, although the concept was not addressed in the present study. Contribution of post-encoding slow wave sleep to remote NOR memory. Contribution of post-encoding slow wave sleep to remote NOR memory. a) NOR performance (discrimination ratio) at the 3-week retrieval test correlated with the number of sleep spindles during SWS (top) and spindle mean duration during the 2-h post-encoding interval (middle), as well as with spindle mean duration during the first 30 min of post-encoding sleep (bottom). b) Intrahippocampal local field potentials (LFPs) were recorded in additional rats to examine the effects of bilateral intrahippocampal infusion of muscimol (Mus) (versus vehicle, Veh) on (from left to right) ripples, spindles, and slow oscillations (SO) in hippocampal networks during SWS. Muscimol decreased the total number and density of ripples, as well as spindle power and slow oscillation amplitude. Credit: Nature, doi:10.1038/s41586-018-0716-8. While ample evidence already exists to indicate involvement of the hippocampus during memory consolidation for their retention and retrieval with normal hippocampal function. New results in the study indicated necessity of the normal hippocampus to form persistent long-term representations on a task that is classified non-hippocampus-dependent. To understand how the hippocampus contributed to long-term NOR memory formation, the researchers proposed that during sleep the hippocampus likely boosted object representation by activating context-related representations instead of direct perirhinal object memory enhancement. 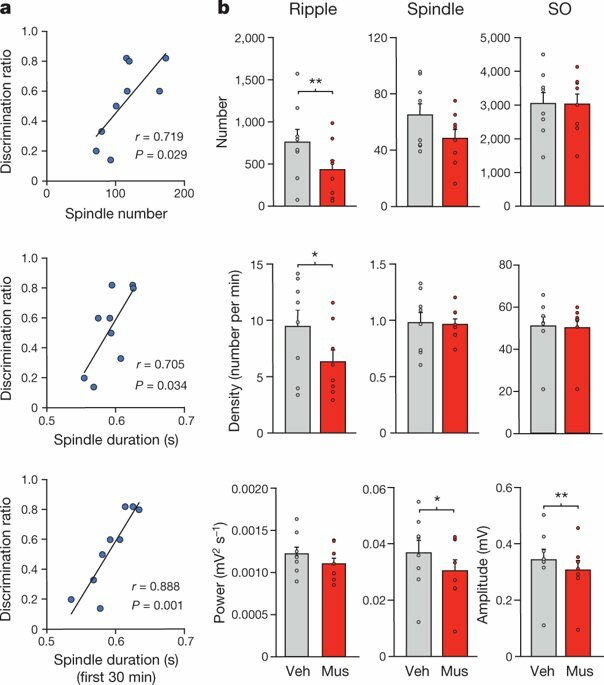 This proposal was supported by the observed correlation of long-term NOR performance with post-encoding sleep spindle activity. Comprehensive findings of the study suggested a common hippocampal mechanism that boosted consolidation in both hippocampus-dependent and non-hippocampus-dependent memory systems by reactivating contextual features. Since non-hippocampal-dependent memory is heterogenous (motor skills, fear conditioning etc. ), other memories of the nature require investigations so as to support the proposed general hippocampal mechanism of long-term memory formation.